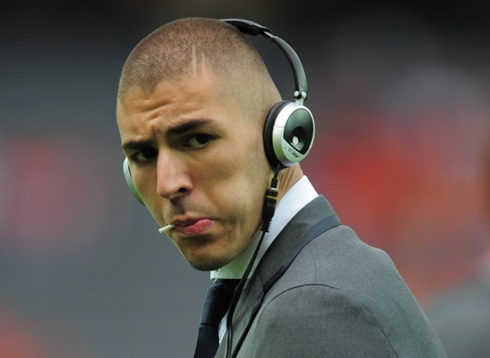 ﻿ Benzema: "I would love to play with Messi and Cristiano Ronaldo"
16.05.2012 » Benzema: "I would love to play with Messi and Cristiano Ronaldo"
The 24-years old, Karim Benzema, has raised the bar this season and seems to have finally convinced all football critics with his performances and consistency shown for the Merengues. The Frenchman granted a few statements on the closure of this season, saying he's truly delighted to work with José Mourinho and that he would love the idea of an unlikely scenario where he would be able to play with Lionel Messi and Cristiano Ronaldo, in the same team. Karim Benzema had his best season ever, with a total of 32 goals splitted between La Liga (21), Spanish Cups (4) and the UEFA Champions League (7). Another impressive stat was his assist count, with 15 passes that allowed his teammates to score, througout many of this season's games. 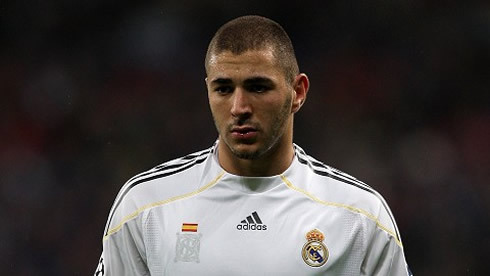 Now seen as one of the most important players on the current Real Madrid squad, Benzema will also carry that burden to the French National Team, where he will certainly try to help his country to reach glory in the upcoming EURO 2012. One his opponents in the EURO 2012, co-hosted by the Ukraine and Poland, will be precisely his teammate and good friend at Real Madrid, Cristiano Ronaldo. The French striker is well aware of Ronaldo's talent, but when it comes to choose between CR7 and Messi, he simply can't pick just one. Benzema: "Cristiano Ronaldo or Lionel Messi? I really can't pick just one, simply because they are totally different players. What I would love to do is to play with both of them in the same team! ", replied the former Olympique Lyonnais player, when sharing his view on the two highest goalscorers of La Liga this season, as Messi netted 50 goals for Barça and Ronaldo had a personal count of 46 in a Merengues shirt. One of the most important persons responsible for the "Benzema transformation" over the last two years, has certainly been Real Madrid's head coach, José Mourinho. The French striker is well aware of the help he received and didn't have any problems in pointing José Mourinho as the best coach he has ever worked under, in his career. Benzema: "On my book, Mourinho is absolutely the best coach there is. I've had the chance to work with several great coaches over the years, but he is without doubts the best out there", remarked the Real Madrid forward, just before explaining how important Zidane and Mourinho were, in his adaptation to a new club and city. Benzema: "Zinedine Zidane's help was crucial for me, as he is the best French player of all time and he spoke with me in numerous occasions. Mourinho was always straight when it came to talk about what he wanted from me. We chatted a lot and he truly showed he trusted in my potential and abilities", pointed out the 24-years old. Even though the French forward still have many years ahead in his football career, the thoughts of hanging the boots at Real Madrid, don't seem to be something that frigthens him at all. 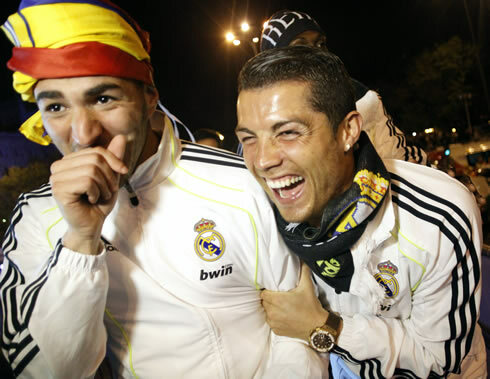 Benzema: "Why not finishing my career in Real Madrid? I'm not sure if I'll be able to play as many years as Raul did for this club, but that's surely a possibility! Everything is perfect these days and having won the Spanish League has done wonders for us. We are all really proud of being part of this team", noted the Frenchman, who scored 21 in this La Liga campaign. France has been drawn in the EURO 2012 Group D, alongside with England, Sweden and co-hosters, Ukraine. 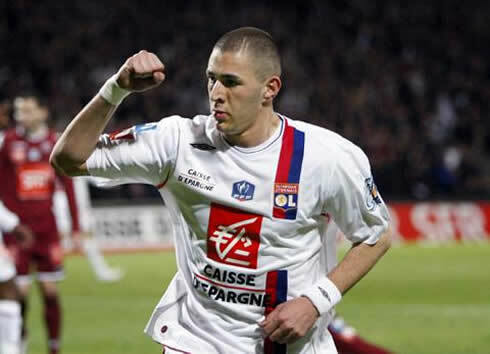 Benzema is expected to be on the line-up when the French side make their debut on the competition against England, on the 11th of June 2012. The 2nd fixture will take place on the 15th of June against Ukraine, while the last group stage game will put them in front of Sweden, on the 19th of June. Real Madrid's season is now over and there are no games left in their schedule until the pre-seasons starts over, by July 2012. Cristiano Ronaldo's next game will be for Portugal, in a friendly game against Macedonia, on May 26, in order to start preparing the EURO 2012. You can watch Juventus live stream, Portugal vs Macedonia, Barcelona vs Athletic Bilbao, Bayern Munich vs Chelsea and Juventus vs Napoli, all from our football live streams section. Cristiano Ronaldo will most likely be on the line-up, when Portugal hosts Macedonia.